Ever wonder why some CFOs constantly push staff to do more with less? The short answer is that there are still a lot of finance people doing “back-office” administrative tasks. The hint of snobbery in that statement intentionally underlines how some clout-wielding operating managers view finance: a necessary cost that should be minimized and never allowed to creep. Some CFOs cannot escape that pressure. So, what are reasonable parameters? Benchmarking various cost categories of the finance function helps to clarify how one’s finance group compares to other organizations in terms of cost-efficiency—and where less resource allocation would be wise. (See Figure 1; click on figure for larger view.). Employee compensation costs (salaries and wages, bonuses, overtime, and benefits). Fringe costs (contributions made towards the employees’ government retirement fund, workers’ compensation, insurance plans, savings plans, pension funds/retirement plans, and stock purchase plans. These should also include such special allowances as relocation expenses and car allowances.). 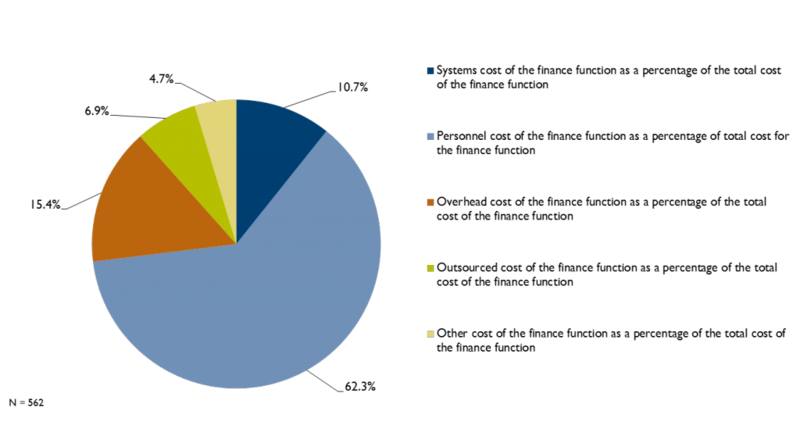 A bit more than 15% of the total cost of finance is allocated to overhead, which is generally tied to the size of the finance staff population. Computer hardware or computer software acquired by the organization or provided to the organization through service contracts. Any costs related to process management and services and maintenance of computer hardware or computer software. The costs of providing and maintaining services for each applicable process (e.g., computer systems processing (CPU) time, network/system communication charges, maintenance costs for applications and data storage). This includes the costs related to LANs, WANs, etc. It does not include one-time costs for major new systems developments/replacements. Consultant fees are not included in depreciation of new system implementations. System cost includes only those costs that occur more than six months after implementation as normal system maintenance costs. Any systems cost (e.g., maintenance) which is outsourced to a third-party supplier is captured in the separate cost category labeled as outsourced cost. Systems cost includes all salaries, overtime, employee benefits, bonuses or fees paid to full-time, part-time or temporary employees or independent contractors who perform services relating to computer hardware, computer software, and processing or systems support. APQC also defines outsourced costs as follows: the total cost of outsourcing all aspects of the specified process to a third-party supplier. It excludes one-time charges for any type of restructuring or reorganization. Outsourced costs also include costs for intra-company outsourcing (i.e., reliance on a shared services center or other business entity). Surely, a CFO will want to look at both cost and time allocations in terms of industry specific peers to get a firmer grip in where his or her organization stands. In general, though, one has to wonder why process automation hasn’t delivered a better result. Thought leaders such as Accenture’s David Axson, a long-time observer of the scene, would be quick to point out that progress has indeed been made—a decade ago, 80% of the finance function focus was devoted to transaction processing. 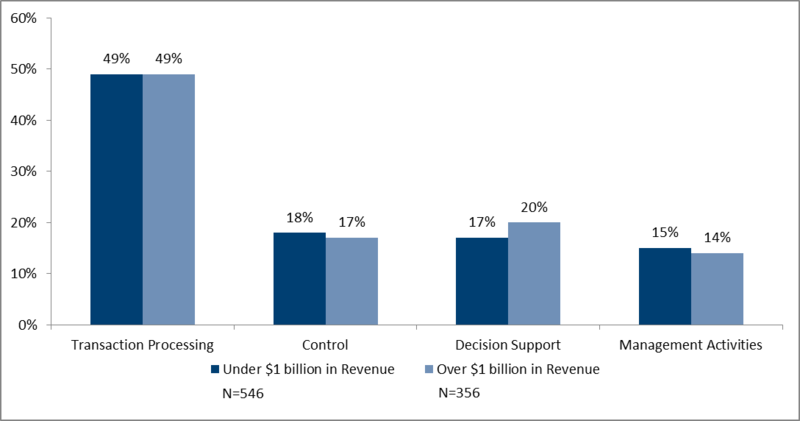 My take: all this goes to show that CFOs are skeptical about claims that process automation is the cure-all. Surely, one can engage in process streamlining and aggressive workflow automation. But on the other side of those commercial transactions sit suppliers, customers, and even employees. Until software robots can handle the sensitivity of interpersonal communications with grace and aplomb, we still need people. What is the right proportion? That’s for each CFO’s studied judgement. Mary Driscoll is senior research fellow for financial management at APQC, a nonprofit business benchmarking and research firm based in Houston. ← Would You Have Invoked the Disaster Recovery Plan?